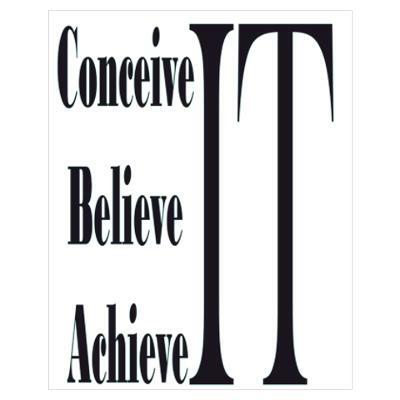 The phrase ‘Conceive, Believe, Achieve’, finds it roots from the mentor Napoleon Hill – It was later adopted and given an addition by another highly successful man – W. Clement Stone. No truer words have been spoken! But really, what do this have to do with golf. Do you think that Phil Mickelson, who was 1 centimeter from shooting the ever elusive 59, has ever sat on his couch and thought of what it would feel like to break 60. I say – absolutely! Hasn’t everyone. Do we not think of shooting a hole-in-one, chipping in from 150 yards, making a 60 foot put for eagle or winning the club championship on the 18th hole with everyone watching? If you said yes to any of these statements, then you are half way to setting yourself up for success on the golf course. Manage your internal expectations and reality will tend to meet them. Although this is not just for golf, it can easily be applied to our favorite game. The use of positive mental imagery is nothing new. It is all around us. At Clear Mind Meditation Techniques, they describe how to use this powerful technique. It is very simple, yet can change even the greatest obstacles. Norman Vincent Peale said that “we tend to get what we expect.” So why not expect great things on and off the golf course! At GolfMindShop.com, they talk about four benefits of positive mental imagery: emotional control, perfect result imagery, physical bio mechanics imagery and self-image “Engineering” imagery. These benefits are very important to success on the golf course. It is not just about swing mechanics, but developing a strong mental attitude in all areas of the game. At Golf Mental Game Coaching also outlines the benefit of using mental imagery to change your game. They go into more detail of what areas can be affected, but the process is basically the same. Ultimately, each player will decide the area they what to improve – keeping it all positive will definitely help. In an earlier post “When Life Gets In the Way“, I suggested a 5-minute mental exercise to calm your mind and to focus your efforts while running to the first tee. The techniques suggested today are an extension of that exercise. It allows for a total examination of your game and will help improve your mental toughness. There is no specific length of time one should perform mental imagery….it really is up to the individual. Golf is not just about swing a club. A positive mental attitude through imagery is a fantastic technique to improve your game. What other tips would you suggest to help with your golf game? ← Only 75 Days to Go!